This book is dark, like really dark. The first aspect that leaps out at you is the suffocation of light even during the daylight scenes. Whether this is Jason Shawn Alexander’s preferred style or the direction he wishes to take the book, remains to be seen but it is effective nonetheless. The characters are drawn with great detail but not from an ink and line perspective as such, but from the textured colouring of shades. Our central protagonist Corinne carries the burden of her past heftily on her expression, which is impressive considering the first thing you would notice about is the loss of her arm. Her depression emanates through the page and her ever so slightly furrowed forehead taint any positive emotion she might see herself worthy to have. Her interactions with her friends and enemies are cries of solitude and screams of salvation. 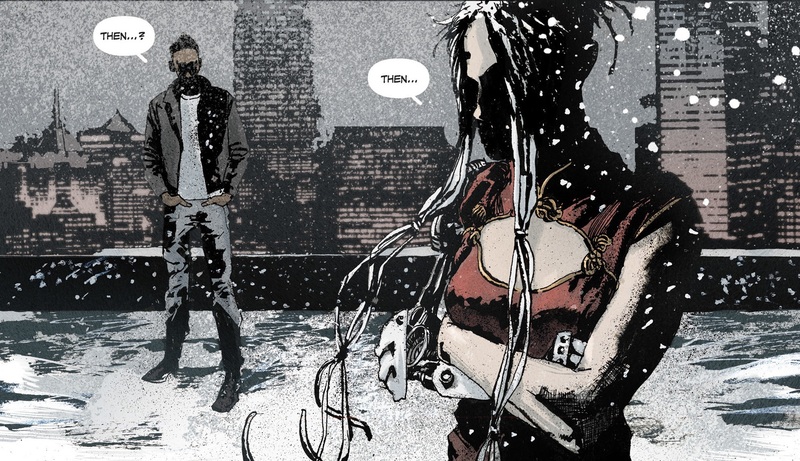 The final issue of the story arc takes you into her darkness and tries to bring in some light. Jason Shawn Alexander provides the story and artwork with Luis Nct on colours. The post-apocalyptic environment, in which this book is set, is perfect for the emotionally addled Corinne. It is often nighttime sucking out the richness of any colour, and also snowing which really impresses how amazing the artwork is in providing such visceral expression. The locations are seedy but the action sequences take place in almost industrial venues juxtaposing weaponry with machinery, especially Corrine’s deliberately mechanical looking prosthetic. The story is relatively archetypal in that the protagonist is subdued with a secret past. But it does not feel that way because she has such aesthetic depth and her appearance is genuinely quite unique. She wears her mechanised arm as a reminder of her sins but then dresses in quite pretty kimono-esque garb with long white dreadlocks. She would traverse that femme fatale line if her menacing nature wasn’t left in her past. 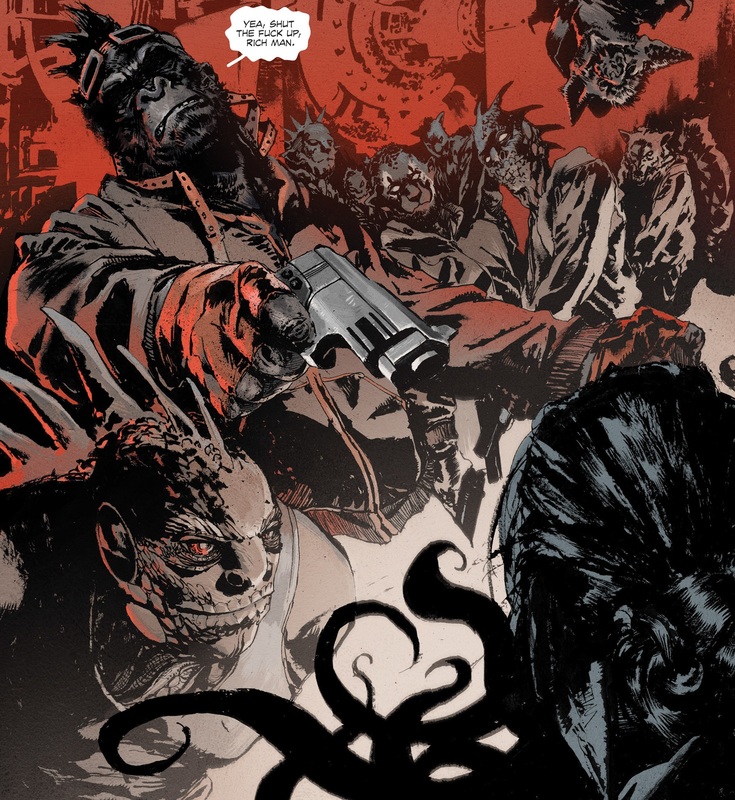 The villains of the story are the genetically engineered ferals, the zombie ghost soldiers and the company liaison with tentacles for a mouth. There are certainly some interesting angles for artistic creativity. They are all drawn with great panache and gusto with no character left bland in the background. There is a slight distortion at hand, which lends to the aggression or emotional turbulence. The action is certainly panel based with little flow or dynamism, but that doesn’t prevent any loss in direction or appreciation of the action. In fact the textured colouring of the figures and the blows they receive, well emphasises the impact of the fight. These panel snapshots are glimpses into a battle that is bloody and gruesome. These pages provide such impressive contrast to those above in the night sky, where our lead finally reveals her past. Those moments are artistically amazing as the heinous acts of violence are embraced by the comfort of darkness, almost as if to hide the full memories of those times from Corrine herself. 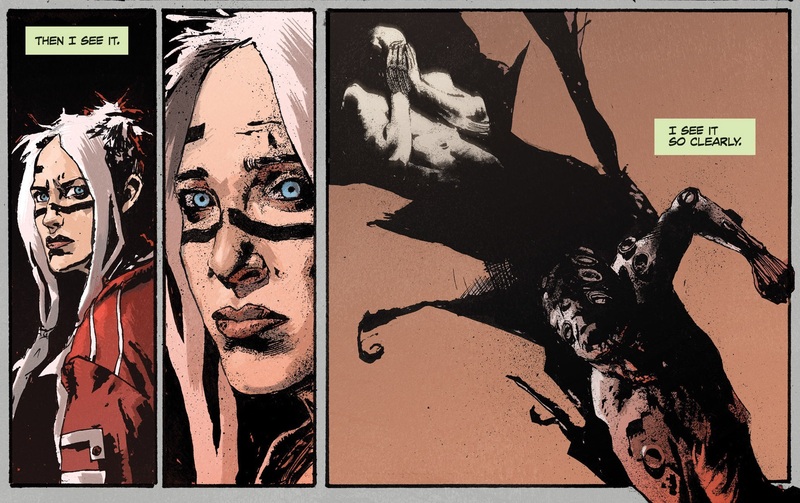 The balance between the two central tenets of this comic, violence and atonement is so impressive that you can fully understand the person she once was and the person she is now. The ghosts of the past literally come back to haunt her, but instead of recoiling in shame, the confrontation is delicately handled and the light begins to slowly make its way in. Jason Shawn Alexander is certainly an impressive artist and this work is masterful in storytelling, balancing themes and in the growth of his protagonist. That is not to ignore Nct’s invaluable contribution to the colouring. 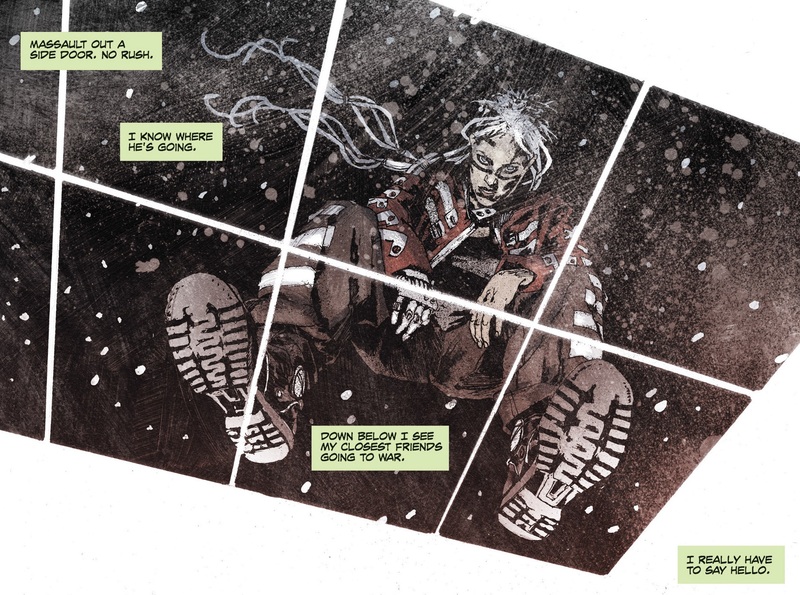 Empty Zone may not be too welcoming as it sits alone in the dark but its redemptive resurgence is one that I hope sees many more artistic endeavours on the shelves for these immensely talented creators.